Prepared as a Word 2003 Document. By Mike Allfrey – January, 2007..
As a regular reader of (and irregular contributor to) the Club Journal, I have often felt that the best use was not being made of the media available. If we consider, that we must have a combined Jowett experience within the club, exceeding one thousand years, then the articles printed to date have not reflected this massive source of knowledge. I have decided to have a tilt at the windmill, in the hope that this will aid both the Editor and the club through supplying a detailed analysis on the Jowett Javelin/Jupiter gearbox. I do not claim to be an expert on this but act merely as a catalyst in the reactions which hopefully flow from this epic task. The aim of the following article is to set the example, starting a little pile on which you can add your contribution. I have tried to set out in a logical manner all the facts that I can think of in relation to the gearbox. In this area, as in so many others, the manual leaves a considerable amount unsaid. I have also tried to bear in mind that when the manual was written, the wearing qualities of the various parts could not have been predicted. In a way we can use thirty years of hind sight. To this end I have numbered all the paragraphs evenly, allowing any learned contributor to add in the "odd" paragraphs where his/her experience can help. Ultimately we will thus end up with a completely detailed set of instructions on the gearbox. In addition, should the idea appeal, someone else may care to write up in similar detail other parts of the car's anatomy. A clean working environment free of dirt, and clean parts that are free of rust, oil and dirt are essential, as are a copious supply of clean rags. All re-used hardware should have been wire-brushed, protective coating applied (Inox, WD-40 or such) and stored in labelled, re-sealable plastic bags that are stored in logical groupings, ready for easy location as required. 1. The gears are selected in the gearbox by means of two shafts. 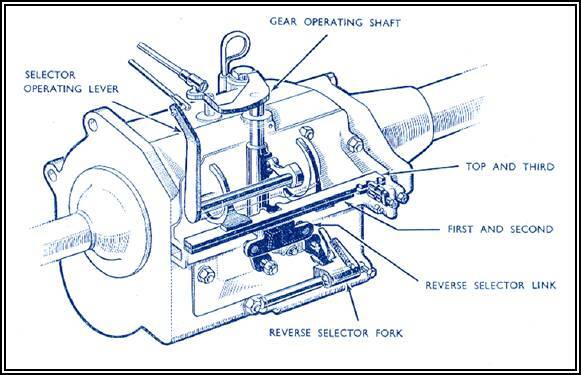 The gear operating shaft and the selector change shaft. 2. The gear operating shaft acts in the vertical plane and can take up three distinct positions: In the upper position it selects 3rd and 4th (top) gears. In the intermediate position it selects 1st and 2nd gears. In the lowest position it selects reverse gear only. 3. Rotation of the gear operating shaft, allows this shaft to select one or other of the gears in the upper and middle positions, or one gear in the lower position. Looked at from the top, rotation of the shaft clockwise selects 2nd gear and, 4th gear, anticlockwise rotation selects 1st, 3rd and reverse gears. 4. The selector change shaft acts in the horizontal plane and by rotation of the selector change lever, causes the gear operating shaft to take up one of its three positions. Looking from the front of the gearbox, when the selector change lever is at 1 o'clock the upper selector bar is in operation (3rd and top), at 12 o'clock the lower selector bar is in operation (1st and 2nd), and at 11 o'clock NO selector bar is in operation, (in fact the lower bar is locked to prevent it operating) and reverse gear can be selected. 5. To inspect the gear selection of the gearbox when it has been removed from the car prior to dismantling, or after reassembly, the gearbox should be attached to the Clutch housing and the clutch shaft cover should be in place. A spare clutch housing is useful for this exercise. Unless the gearbox is thus attached, selection of top gear will push forward the front mainshaft ball bearing, thereby releasing the synchro balls; and springs on the 3rd and 4th Synchronizer. 6. Check for excessive play on the clutch (or spigot) shaft. When present this will indicate either a worn mainshaft front roller bearing, Part No. 50017(the little caged rollers may have become un-caged), or a worn clutch shaft ball bearing, Part No. 50014. 7. Check for excessive play on the vertical gear operating shaft. Where present this will indicate that the gearbox housing has worn (the bore is oval) and will need bushing, or that the gear operating lever lug is worn (which will need replacement or be built up with weld). 8. Depress the gear operating shaft by hand and select reverse gear. Note whether or not the gear change lever hits against the stop on top of the casing. In some instances noted, the gear change lever will strike the base of the stop instead of the stop itself. This can be rectified by fitting a shim on the outside of the case below the gear change lever or the lower face of the lever can be filed off as much as 3 mm to correct the action. 9. On releasing the operating shaft (after depressing it) check that it returns to the upper most position naturally. If not the operating shaft spring may be broken or distorted, or the selector bar notches may not be correctly aligned (wear in the plunger notches or the plungers themselves allowing the selector bar to move backwards and forwards) causing the gear operating shaft lever lug to miss the recess in the bars or catching the edges of the bars. 10. Check the selector change shaft movement in the horizontal plane. More than 2 mm of movement fore and aft indicates that take up of wear on the selector lever pad is necessary by shimming on the outside of the gearbox casing immediately behind the selector change lever. 11. Check for cracks in the gearbox casing particularly round the driver's side front lug (which is definitely prone to cracking) due to insufficient tightening of the nut and engine vibrations. This can be fixed with the TIG aluminium welding process. The engine vibration with loose nuts can also cause cracking in the clutch housing particularly near the openings for the clutch fork. 12. Note that since the gearbox casing is cast from aluminium (i.e. a soft material, relatively speaking) which acts also as a bearing medium, all holes in the gearbox are subject to wear and need careful inspection. 13. Drain the oil from the gearbox. It may be helpful to apply some heat so that the plug can be removed easily. NOTE: After removing the drain plug, carefully examine the oil and the inner gearbox housing to look for metal debris. This will give an indication of how the gearbox has been treated. 15. Since this is a description of a major overhaul, definitely drift out the layshaft thereby allowing the cluster gear to drop into the bottom of the box to enable removal of the mainshaft. 16. Whilst it may be possible to "drift out the clutch shaft ball bearing from inside the gearbox", the use of a especially constructed bearing puller that locates in the circlip groove is recommended. NOTE: When removing the mainshaft bearing, it will be necessary to remove some of the studs to allow room for the puller to connect in the circlip groove in the bearing outer race. (See Steps 22 – 24 for stud removal/replacement information). 17. The removal of the bearing oil thrower from the clutch shaft prior to separating the clutch and main shafts (first and third motion shafts) gives a little more room for access. 18. When separating the clutch shaft from the mainshaft, it will be found easier if the clutch shaft spigot bearing is pushed as far forward as possible into the clutch shaft, rather than leaving it on the mainshaft spigot. In addition, the mainshaft can be withdrawn further to the rear if 2nd gear is selected carefully, prior to withdrawing the mainshaft through the side of the gearbox housing. 19. When removing the gears from the mainshaft, the use of a small narrow bladed screwdriver is recommended for depressing the plungers of the mainshaft lock washers. 20. To remove the reverse gear shaft with ease, use a socket, some washers and a 5/16" BSF setscrew to make up a puller. A tapped hole is provided in the shaft for this purpose. 21. Dismantle the entire selector housing cover even though this is NOT mentions! in the manual as it will need to be refurbished for a complete overhaul anyway. Carefully determine the operation of each of the levers and shafts in the cover as most of the trouble with the gearboxes can be traced to them. Once you fully understand the operation and function you will wonder, like me why there is no mention of it is made in the Maintenance Manual. 22. To remove studs from the gearbox, use two nuts of appropriate size for the stud concerned, and thread these onto the exposed portion of the stud. Lock the lower nut against the upper nut by tightening the nuts against each other. 23. To remove the stud, after locking the nuts together, turn the lower nut anti-clockwise, the stud will unscrew. 24. To install a stud, after locking the nuts together, turn the upper nut clockwise. When the stud is fully borne against its shank, release the nuts; by holding the upper nut still and turning the lower nut clockwise until free, then spin off each nut individually. NOTE: Before installing a stud make sure that the surface around the threaded hole is flat. Distortion here can cause oil leakage at a poorly seated joint. Apply a smear of Penrite Copper Eze to the thread when the stud is being installed into a blind hole. Apply a smear of Loctite 518 Mastergasket if the stud’s hole breaks through into an oil-wet area. IMPORTANT: Studs should be tightened to 20 per cent of the securing nut’s final torque value. 25. Gearbox housing – bearing in mind what has been previously stated about aluminium housings, thoroughly clean and air dry the housing, inside and out, with good quality degreasing fluid and rinse thoroughly with clean water. 26. Check again for cracks around the lugs and around the rear ball bearing. The rear stud holes are close to the edge of the casting and are prone to cracks also. Also, check the bore for the mainshaft ball bearing as incorrect (skewed) fitting can crack the casting. 27. Check the ball bearing surfaces for signs of the bearing having turned in the case. Score marks and/or a bluish tinge indicate turning and heating effects. If the surface is scored or otherwise worn, the gearbox housing will have to be replaced. If wear is minimal, apply three drops of Loctite 292 Threadloc (wick-in), equally spaced, between the housing and the bearing outer race. This should be done after the gearbox has been assembled, and with the components clean and dry. 28. Check the underside of the gear operating shaft upper hole for wear. If wear is apparent, you will need some shims to take up the vertical slack in the shaft on assembly. Failure to take up this slack will cause the gear operating lever lug to miss the recesses in the selector bars or to "half" connect in the recess. 29. Check the gearbox studs for loose studs or stripped threads. New studs can be manufactured from 1/4" BSF bolts cutting the bolt on the unthreaded portion below the head and then using a button die for cutting a 1/4" Whitworth or BSF thread, depending on the gearbox housing thread, on the unthreaded portion of the bolt. Enlarged threaded holes should be fitted with Helicoils (Recoils) whereupon you can use studs with a BSF thread at each end. This is one of the few instances where JCL mixed threads. 30. Remove all the studs from the gearbox side and check the surfaces for flatness. Clean up where necessary with a fine cut file and polish with an emery stone where the selector bars slide to remove burrs. 31. Check the 7/16” diameter stud at the front of the box lower RH side for protrusion into the inside of the housing. It can cause the layshaft front thrust washer to be pushed out of alignment. Remedy, grind, file or cut the stud to shorten if necessary. 32. Check the 5/16" diameter stud at the rear of the housing, lower left hand side, for protrusion into the housing. It can cause the reverse gear to be pushed forwards, and clash with first gear. 33. Check the gear operating shaft bores top and bottom for Ovality. If oval bore them out to 5/8" and insert bronze bush, DUFOR Part No. 1450, which is long enough to be cut in two to do both top and bottom bores. 34. Smooth all rough aluminium bearing surfaces on the selector housing cover by using a small flat whetting stone to remove scoring where the selector bars have been in contact with the cover plate. 35. Thoroughly clean all the gears with kerosene prior to inspection as the oily surfaces of the gears hide a multitude of sins. Inspect each gear for wear holding it in a strong light checking for heat affected areas and pitting. If possible replace all pitted gears and polish off all sharp edges with a fine emery stone. 36. Check the synchronizer cones on 2nd, 3rd and top gears for wear and lap in the gears on the mainshaft with fine grinding paste. NOTE: With the synchronizer cone and cup pushed firmly together, the cup should hold the cone when held up with the cup uppermost. If the cone drops out of its own accord, the pair of parts are worn. 37. On completion of lapping, thoroughly clean off all traces of the grinding paste by using hot soapy water (which will expand the pores of the metal) with a stiff brush. 38. Check the selector bars for twist and bowing. Straighten with a hammer on a flat steel plate or anvil. 39. On completion of straightening, use a smooth file to clean up any nicks or slight alignment problem. Remove sharp edges with an emery stone to prevent cutting into the aluminium casing. 40. Check the selector bars for bowing by holding the bars back to back against a strong light and looking for gaps. 41. Inspect the bars for cracks especially round the corners of the recess in the bars where they connect with the gear operating lever lug. 42. Check the action of the gear operating lever lug in the recesses of the bars for reference prior to building up the lug or filling in the recesses of the bars. File away any high spots on the bars. 43. Inspect the selector bar notches for "tracks" created by excessive pressure on the selector plungers. If scored or grooved, the bars will need to be built up with Stellite welding to maintain their hardness. 44. Check that the bronze selectors are not loose on the bars. If looseness is found, new rivets will have to be installed. 45. Check for wear at the top of the shaft and on the bottom. At the top the shaft is likely to be worn on one side only. If worn, the shaft should be replaced. The bottom of the shaft is likely to be worn in a tapered manner. 46. If the shaft is in a chronic state as described above, the housing will be so much the worse for wear and will need bushing. To do this properly you need to remove the welch plug at the bottom of the casing. This will then allow the use of a long boring bar or reamer to align both top and bottom bores. This operation does require the use of a good quality reamer to fine finish the two bores. 47. Inspect the gear operating shaft spring for "kinking". This can be straightened out to some degree through winding the spring onto a round rod and then squeezing the spring with a pair of pliers. Better still if possible replace the spring. 48. Examine the gear change lever for wear. It should fit neatly in the machined flats on top of the shaft. If loose, build up the shaped hole and file back to shape. NOTE: A small amount of rotational movement can be coped with by using Loctite 680 Adhesive during assembly. 50. Examine the lower face of the gear operating lever for wear. This is very important since excessive wear makes the selection of reverse gear an IMPOSSIBILITY. i.e. the lug may connect in the recess of the reverse selector link but the locking mechanism cannot come into play on the 1st and 2nd selector fork. If the face is badly worn it can be built up with weld and trued back with a file. 51. Check the detent plungers for excess wear or flatness. Many develop a diamond pattern on the hemispherical surface which prevents rotation of the plunger. 52. If necessary have the plungers built up with Stellite weld and ground back to round (or install new ones). 53. Use an emery stone to true up the rear face of the reverse selector link. The sliding block rubbing against the aluminium gear selector cover. Smooth action here aids reverse gear selection. 54. Build up the face of the reverse selector lock, where it makes contact with the bottom face of the operating lever, with weld. This will probably have worn in a crescent shape as a result of rubbing action caused by the lower face of the operating lever. NOTE: If this lever is not built up it makes the locking of the 1st and 2nd selector fork impossible when selecting reverse gear. As a consequence, you may collect reverse and second gear at the same time, completely locking-up the gearbox. 55. Examine the layshaft for wear caused by the layshaft bearings rollers. NOTE: If wear has taken place, a new shaft should be installed. 56. The club has a better version of the original caged-in-brass bearings in stock. 57. Check that the layshaft is straight. This is best done by pushing it back in the casing from the rear while all the internals are still out and then seeing if it lines up cleanly with the front hole. If bent it will not line up with the hole. NOTE: Carry out this check now! 58. Place the gearbox housing with the front of the housing mounted on protected vice jaws and the threads of the front stud protected, so that the open side of the box faces you. Then tighten the vice against the stud. 59. Now do a trial assembly of the layshaft group by fitting the layshaft front washer, Part No. 50071, then the cluster gear, Part No. 50051, fitted with new roller bearings Part No. 50017, the layshaft rear pad, Part No. 50052, and finally the layshaft rear washer, Part No. 50051 With this pack stacked inside the housing, insert the layshaft from the rear. 60. This step can be made easier by employing a dummy layshaft inside the cluster gear and bearings assembly. The dummy shaft can be pushed through with the layshaft. NOTE: Make sure there is room at the vice jaws for the dummy shaft to pass through the housing, while supported with one hand against the layshaft. 61. Add the necessary shims in front of the layshaft front washer until clearance is less than 0.012” Suitable shims are Gee-Jay Replacement Pack No. 276-2, which contain twelve 0.005” shims which need to be trimmed to clear the locating spigot on the front face of the front layshaft washer. Using these shims it is possible to end up with approximately 0.005” end float, which is the preferred end float specification. 62. A dummy layshaft can be cut from a worn layshaft, to a length equal to the cluster gear and the washers for later assembly ease. 63. Having polished the reverse selector link and built up the reverse selector lock, reassemble the reverse selector mechanism. NOTE: The slotted nuts on the outside of the cover are of two different thicknesses and that the amount of thread showing on the post and reverse link pin also varies. Fit the thin nut on the stud showing the least thread. Make sure that the thin plain washers are placed under their respective nuts. 64. While these parts are being assembled, apply smears of Nulon L90 Xtreme assembly lubricant so that the mechanism is properly lubricated. 65. Apply a smear of Loctite 518 Mastergasket under the plain washers to seal the reverse selector posts. Wipe away any excess sealant. 66. Tighten the nuts to hold the posts tight in the selector cover. Nip up, then tighten further to align the split pin hole with a pair of slots. 67. Check that the spring on the reverse selector lock is working freely and is not pinched between the link and the raised portion of the selector cover. Check the action of the reverse selector shaft, it should be possible to push the fork along with a firm action by hand. If too tight slacken the screw forcing the spring and ball in the reverse selector shaft groove until the action is firm but positive. Check that the action of the reverse selector shaft allows the spring on the reverse selector lock to perform its function, i.e. return the reverse selector lock to its free state. Some filing may be necessary on the reverse selector lock to achieve a smooth action. 68. Partially reassemble the gearbox as follows to check various clearances. 69. Install the gear operating shaft, operating shaft distance collar, gear operating lever and spring and fix with the mills pin. Don't bother about the woodruff key at this stage. In installing the spring it is easier to install the spring and the gear operating lever and then sliding the shaft through the spring and lever. 70. Insert the straightened and aligned selector bars. 71. Install the reassembled selector housing cover without the plunger housing and plungers at this stage. Apply smears of Nulon L90 Xtreme assembly lubricant to the sliding components. Two stud nuts at each end of the selector cover, adjacent to the selector bars, can be tightened. 72. This partial assembly will allow a check the operation of the gear change mechanism without the gears being present to block your view of the proceedings through the bearing bores.. The action can be extremely revealing. (i) Note the gear operating lever lug location in relation to the upper selector bar (3rd and top) recess. If it sits too high, shims placed under the distance collar will fix it. (ii) Note the selector change lever assembly fore and aft movement. If too loose, the pad will not be in contact with the operating shaft. Fit shims behind the lever on the outside of the housing. (iii) Note the action produced by the bottom face of the gear operating lever. This face is designed to depress onto the reverse selector lock when the gear operating shaft is in its lowest position, and by see-saw action cause the other end of the lock to engage onto the 1st and 2nd selector fork preventing double selection of the gears. If the lock has not been previously built up, you can now gauge the amount of build up or file down required. (iv) Note also that the lower face of the gear operating lever causes locking of the 1st and 2nd selector fork. If the surface of the reverse selector link is not smooth, or the edge of the reverse selector lock catches in the recess of the reverse selector link, or the reverse link lock spring is weak, you may be stuck in reverse gear forever. Touch up the rough edges with an emery stone or file the edge of the reverse lock selector as necessary and replace the weak spring. (v) See that the gear change lever on the top side of the casing does not foul on the gear lever stop when the gear operating shaft is trying to select reverse gear. If necessary file a part of the bottom face off the lever to overcome this clearance problem. It is my belief that this is the cause in many cases, of the gearbox jumping out of reverse gear (i.e. the selector was never fully home and the ball in the reverse selector fork had not yet reached the groove in the shaft. (vi) Note whether the action of filing the side cover flat has caused the opening for the selector bars to be too small. If so file down the back of the selector bars. Bear in mind that you have neither gasket nor sealant between the selector cover and the housing at this stage so don't be too keen to file down the backs of the selectors. (vii) Check that the recesses in the selector bars produce a full and positive action with the gear operating lever lug. If necessary fill in the recesses of the bars with weld and/or build up the face of the lug. (viii) When all the above points have been checked and adjusted, reassemble the housing one more time, but this time include the plunger housing and plungers. (ix) Adjust the plunger setting by selecting a position halfway between neutral and 1st gear. Screw up the plunger adjusting screw till just tight and then release the screw half a turn and lock with the locknut. (x) If everything has gone to plan you will now have spent about 20 hours on the gearbox and you are more than halfway home. You should hear some nice "clicks" when selecting any of the gear positions and the action should be smooth. (I used to think that, the "clicks" were caused by the synchro balls connecting with the internal grooves of the sliding gears but have since discovered that this is not so). It is now time to start thinking about assembling the gears for the proper installation into the gearbox. 74. There is a missing tooth from the spline of the 1st sliding gear, which must line up with the drilling in the mainshaft to allow the 1st gear interlock to work. The use of a piston ring compressor for fixing the greased springs and synchronizer balls is advised when fitting the 1st and 2nd gear sliding dog onto its correct sliding gear. 75. The spring-locating pin and spring can be easier fitted after fitting the thick mainshaft lock washer as the 1st sliding gear can be moved back sufficiently to allow the washer to move back with it. Having fitted the spring and pin, depressing the pin and moving the whole sliding gear forward allows the thrust washer to fit into the groove in the mainshaft. Lock the washer by rotating it allowing the pin to enter the washer spline recess and lock in position. 76. Reference is made in the Maintenance Manual, to the difference between 2nd and 3rd gear bronze bushes, it does not state which way the bushes should face. The answer is that the counter bores on both bushes should face away from the central mainshaft thrust washer. The orientation of these bushes is shown in the Spare Parts Catalogue. This is a trap for those who do not know, as the counter bore in the bush is designed to clear the pin. Since the central thrust washer is the thin one, it could be considered that the pin would stick out more on it than on the thick thrust washers. This is not the case. Note also that the central annular oil way rather than the spiral ones line up with the drilled hole in the gear for oiling purposes. 77. Fit the second gear bush and the gear itself. 78. Now fit the central locating-spring and pin and then fit the thin thrust washer. Lock the washer by rotating it, as in Step 75.. There is another solution to the problem, it is not too difficult to modify the related components to accept another thick thrust washer. This requires some skilful machining, but is entirely successful. Plastic thrust washers can also be considered. 79. Fit the 3rd gear bronze bush with the recess facing forward (i.e. towards 4th gear) and then fit third gear itself. 80. Fit the front locating-spring and pin and then depress the spring and pin through the hole located in the third gear synchronizer cone, then slide on the front mainshaft locking washer and lock it by rotating it, as in Step 75. 81. Fit the 3rd and 4th sliding gear, with the etched numbers on both it and the sleeve facing in the same direction. 82. This completes the assembly of the mainshaft. 83. Insert the hardened steel spacing ring in the clutch shaft, Insert the main shaft (third motion shaft) spigot bearing into the clutch shaft, apply a liberal smear of Nulon L90 Xtreme assembly lubricant. 84. Check the fit of the clutch shaft on the mainshaft spigot and, if necessary, reduce the free play by fitting a further spacing ring on the mainshaft. 85. Reassemble the cluster gear assembly. 86. Insert the hardened steel spacing rings at either end of the gear cluster. Insert the bearings at each end of the cluster gear applying Nulon L90 Xtreme assembly lubricant. 87. Insert the dummy layshaft to hold the shims, washers, bearings and pad in place as a group. 88. Insert the gear cluster including all shims and pads in the housing and allow it to drop into the bottom of the housing. 89. Insert the clutch shaft assembly through the side of the housing. 90. Select 2nd gear on the mainshaft (for easier entry) and insert the mainshaft assembly through the side of the housing. 91. Now carefully push the mainshaft spigot into the clutch shaft in a straight-line action, to prevent damage to the spigot bearing. 92. Grip the mainshaft in a vice, so that the gears on it are clear of the cluster gear. 93. Line up the cluster gear and washers with the holes in the housing and insert the layshaft from the rear of the gearbox, pushing out the dummy shaft as the layshaft passes. through to the front of the housing. This is not an easy task. 94. Insert the reverse gear assembly, with the teeth towards the rear and the selector collar towards the front. 95. Install the fr6nt oil thrower disc. 96. Fit the clutch shaft mainshaft ball bearings and install their circlips. The bearing bores should be lubricated and the bearings driven home with a suitable hollow drift. NOTE: The bronze speedometer drive gear should be installed at this time. 97. Install new tab washers, lock the gears and tighten the bearing securing nuts dead tight. Carefully bend over the tabs against flats on the nuts. 98. Ensure that the selector cover has the reverse gear selector fork in the right position, the locking lever lug should lie in the reverse selector link recess. 99. Install a new extension housing bearing sleeve. The sleeve should be pressed in against the spacer washer. 100. Install the rear extension housing roller bearing, followed by the rear spacer washer. 101. The rear seal should be pressed home against the spacer washer. The currently available modern seal has a slightly smaller outside diameter. This requires that the seal be installed with a small bead of Loctite Blue RTV sealant between the seal and the rear spacer washer. 102. Install the selector cover, using new gaskets and seal with Loctite 515 Mastergasket sealant. 103. Install the rear extension housing using a new gasket and Loctite 515 Mastergasket sealant. 104. Install the speedometer drive assembly. Use a smear of Loctite Blue RTV sealant between the body and the extension housing. 105. Special care must be taken, when attaching the gearbox assembly to the clutch housing, to ensure that the gearbox breather tract is not blocked with sealant. 106. The layshaft protrudes through the front of the gearbox. There is a hole to accommodate the layshaft in the clutch housing. What is not commonly known is that this hole is a large clearance hole. There have been some instances of oil leakage from this area, due to loose fit of the layshaft in the gearbox housing and there is a simple way to repair a loose-fit shaft. . The layshaft diameter is 0.75” and the hole in the clutch housing is nominal 7/8” diameter. Obtain a cup type core plug with 7/8” outside diameter and press it cup side facing the gearbox, into the clutch housing. The cup will spigot firmly over the layshaft spigot. An application of Loctite 290 Super Wick-in will effect a sound oil-tight seal.